He whose attitude towards Christ is correct does indeed ask ‘in his name’ and receives what he asks for, if it is something which does not stand in the way of his salvation. He gets it, however, only when he ought to receive it, for certain things are not refused us, but their granting is delayed to a fitting time. Augustine was Bishop of Hippo, a major city in what is now the country of Algeria, from 395-430 A.D. It is a good thing to let prayer be the first business of the morning and the last at night. Guard yourself carefully against those false, deluding ideas, which tell you, “Wait a little while. I will pray in an hour; first I must attend to this or that.” Such thoughts get you away from prayer into other affairs which so hold your attention and involve you that nothing comes of prayer for that day. Martin Luther, 1483-1546, was a German priest and theologian and one of the principle leaders of the Protestant Reformation. Prayer is not overcoming God’s reluctance. It is laying hold of His willingness. This is our Lord’s will…that our prayer and our trust be, alike, large. For if we do not trust as much as we pray, we fail in full worship to our Lord in our prayer; and also we hinder and hurt ourselves. The reason is that we do not know truly that our Lord is the ground from which our prayer springeth; nor do we know that it is given us by his grace and his love. If we knew this, it would make us trust to have of our Lord’s gifts all that we desire. For I am sure that no man asketh mercy and grace with sincerity, without mercy and grace being given to him first. 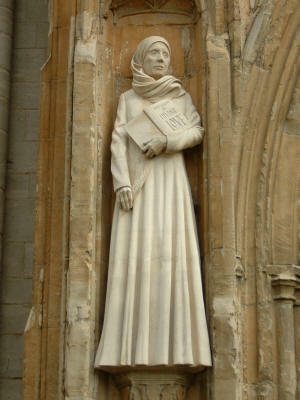 Julian of Norwich, 1342-1416, took her name from the church in England at which she lived as an anchoress – a kind of hermit – engaged in contemplative prayer. It is not so true that “prayer changes things” as that prayer changes me and I change things. God has so constituted things that prayer on the basis of Redemption alters the way in which a man looks at things. Prayer is not a question of altering things externally, but of working wonders in a man’s disposition. When we pray “in the Name of Jesus” the answers are in accordance with His nature, and if we think our prayers are unanswered it is because we are not interpreting the answer along this line. Oswald Chambers was a Scottish minister and teacher who lived from 1874 – 1917. Many people know of him through the collection of his writings assembled by his wife after his death entitled, My Utmost for His Highest. Our wishes and desires … are involuntary and, therefore, not in themselves prayers. They only become prayers when addressed to God … A petition does not become a prayer unless it ends with the words, spoken or unspoken, nevertheless, not as I will but as Thou wilt. W. H. Auden was born in England in 1907 and later became an American citizen. He is considered by some to be one of the greatest poets of the 20th century. He died in 1973. Thomas Merton was a 20th century Roman Catholic monk and writer. George Herbert was an Anglican priest and poet who lived in England from 1593 to 1633. Next week: Some thoughts on the parable of the Good Samaritan: Who is my neighbor? This entry was posted in Prayer and tagged George Herbert, Julian of Norwich, Martin Luther, Oswald Chambers, prayer, St. Augustine, Thomas Merton, W. H. Auden. Bookmark the permalink. Thank you for this wonderful list of prayers that still name needs and desires that are best understood when offered to God rather than carried around by us. The Merton prayer is prophetic. Many thanks. Godandnumbertheory. Thanks for posting these quotes, Claudia. There are several interesting things I see in these quotes. 1. Overall, it seems the earlier the date of the quote (the earlier the person lived), the more certain they are of things, whereas, the later, the less certain. I guess mainly it’s Merton whose quote states less certainty than the others. Sometimes I think we tend to over-think things Theological, and as we do, we end up being less certain than if we didn’t over-think them. It’s interesting, too, that not all those who spent time in contemplation ended up less certain than this quote from Merton portrays him. I think one thing that might interfere with prayer in our society is the belief that we must accomplish a certain amount today. Society pressures us to do that, and pressures us to not take/make the time to pray, to relate to God, to soak in His presence. But without that, we work the rest of the day on that “wrong level”, and do ourselves, God and society a great disservice. Especially in churches this applies. Why are church leaders and parishioners not spending more time in prayer than in prayerless doing? We are not graded by God on how much we do. Our relationship with God and others is the measure of our “success” (if there is such a thing – and who is it that’s measuring this success?) as Christians if anything is. Certainly, there is a “doing” part of our walk, but only after the praying/being part is accomplished. I don’t know if all this makes sense or not. I’m not advocating not doing, but am advocating more prayer and more dependence on God for things to get done and for direction than it seems most churches today seem to do. I’m still looking for a local church whose orientation is more prayer and being than constant worldly doing. Rick, I certainly agree with your comment about the high level of “busy-ness” in a number of churches today. Many well-intentioned programs are launched by clergy and parishioners because these programs seem like good things to do — but has the Lord called them to undertake such work? In some instances, people don’t want to take the time to find out if it is the Lord’s will. I’ve certainly been guilty of this in the past. I used to think if a good idea popped into my head it must be the Lord’s will. Not so. Jesus was not concerned with whether people found him “appealing.” He simply wanted to do his Father’s will. Luke makes a point of showing us, in his gospel, how Jesus took time to pray, to seek his Father’s will, before he made important decisions. He prayed for 40 days in the desert before he began his ministry in Nazareth (and the people of Nazareth rejected him; but Jesus wasn’t focussed on being successful), he spent the night praying on a mountainside before he called his disciples, (and one of them went on to betray him; but it wasn’t a mistake to call Judas), and he prayed in the Garden of Gethsemane before he was arrested and crucified. In Acts of the Apostles, where Luke records the activities of Jesus’ followers, we hear how before and after major decisions and activities the Christian community prays together. This should be our model, too.